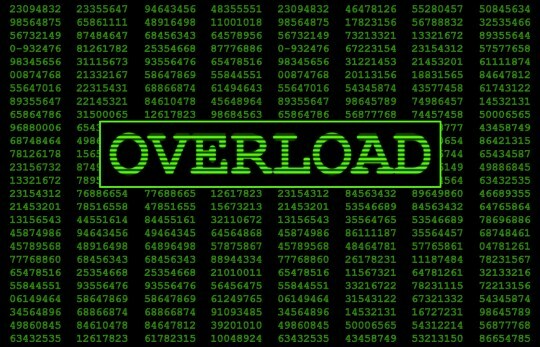 In their day-to-day Google searches many people end up frustrated. But they assume that the problem is their own lack of expertise in framing the search request. In these days of advancing natural language algorithms that isn’t a very good explanation for users or a good excuse for Google. We all have our own favorite examples, but here’s mine because it directly speaks to lost opportunities to use the Internet as a tool of economic development. Imagine an Internet marketing expert who has an appointment with a local chemical engineering firm to make a pitch for her services and help them grow their business. 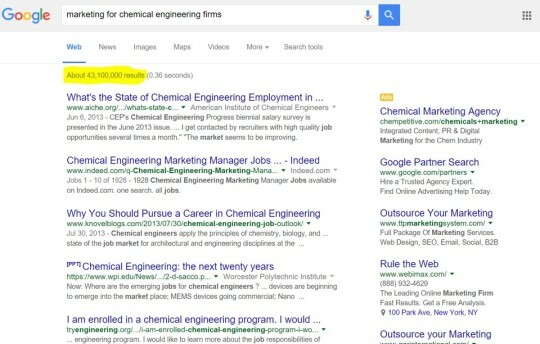 Wanting to be prepared, she goes to Google with a simple search request: “marketing for chemical engineering firms”. Pretty simple, right? She’s unlikely to live long enough to read all 43,100,000+ hits, never mind reading them before her meeting. And, aside from an ad on the right from a possible competitor, there’s not much in the list of non-advertising links that will help her understand the marketing issues facing a potential client. This is not how the sum of all human knowledge – i.e., the Internet – is supposed to work. But it’s all too common. This is the reason why, in a knowledge economy, I place such a great emphasis on deep organization, accessibility and relevance of information. Previous PostPrevious What Comes After Curation? Next PostNext Are Any Small Towns Flourishing?